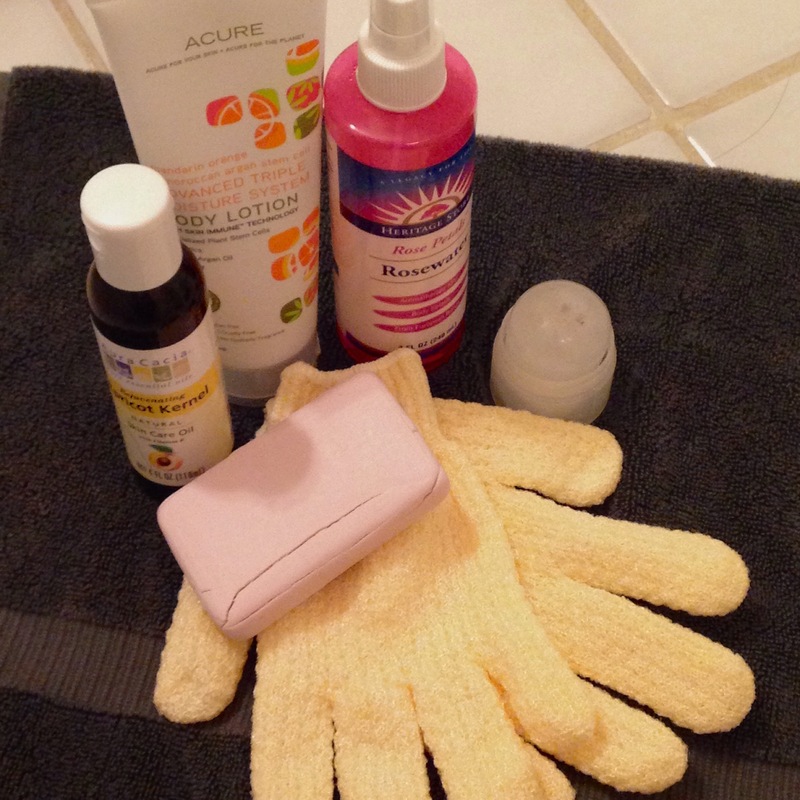 The second part in my series on my beauty routine is my body care routine. My body routine is actually quite minimal, but I use natural products that smell and feel luxurious, so my shower every day is like a mini spa getaway. My body care routine is minimal because I try to make sure my lifestyle is conducive to beauty. I eat a healthy diet and drink plenty of water. I find that eating enough fat is key to having soft skin and shiny hair. It’s a trick I learned in high school when I worked for a chocolatier. I also keep active. This is an important beauty trick, as I find my skin is clearer when I’m active, in addition to my body looking and feeling better. Brisk walks (especially when it’s chilly!) leave me with a renewed sense of energy and a rosy glow. I try to take one nice walk each weekend, and get in bits of walking where I can during the week. I also perform my yoga and dance stretches several times a week to keep my limbs limber. It helps me carry my body more easily. You see, a lot of beauty, especially vintage beauty, focuses on comportment as much as lotions and potions. Victorian women had their corsets to help them maintain erect posture, but I’ve cultivated it on my own. Over the summer, I was cast in a play where I played a character from 1905, and was able to get away without being corseted because my posture was sufficient to give the illusion of corseting. But of course, most people read “beauty” and want to know about the lotions and potions. So I’ll go through my daily body beauty routine. First, I drink a glass of water upon rising. This really should have gone in the skincare post because it’s made all the difference in the world with my complexion. I don’t add anything to it, just a glass of room-temperature water (I keep it by my bedside table all night so I don’t even have to go to the kitchen to get it). After that, I might get up and do some light stretches. Boyfriend takes the first shower most mornings, so I can plan my day, perhaps write a little, and choose my wardrobe. Then, I’m in the shower. My shower is quite short. I will cover hair care in a later post. For my body, I wash with a cotton washcloth and some naturally-made soap with lots of lovely oils, and a light rose scent. Right now I’m using Good Soap from Whole Foods, but I’ve often used Mystic Water Soaps in the past. Most of my body care products are either rose or citrus scented. At the end, I turn the hot water down and rinse off with the coldest water I can stand. Then, I leap out and towel off. I use my rose soap to shave my armpits when they need it, and I use either my soap or a bit of hair conditioner to shave my legs, about once a week. I shave my legs a bit more frequently when the weather and my schedule is conducive to showing a bit more leg, and less frequently in the dead of winter when my legs never see the light of day. When I get out of the shower, I deodorize with a spritz of rosewater and a swipe from a crystal deodorant. I’m sometimes a little funky by the end of the day, but very few things will prevent that for me. So I stick with the natural stuff and try to change clothes or wash a bit if I feel myself getting stinky. Then, I apply lotion to my legs. I usually rub any excess into my elbows and hands. It was a trick to find a good body lotion because I have certain sensitivities, but this Acure lotion is my current favorite. Duly scrubbed and lotioned, I can head to the bedroom to dress! In the bedroom, I finish off the one last step of my body care routine: fragrance. I had a bad skin reaction to some fragrance a few years back, so I’ve become very very careful about what I put on my skin. But I was fortunate to find Pacifica Beauty. All of their fragrances are derived naturally and have never caused a reaction, and their Persian Rose is a lovely pure rose scent, with just a hint of the warm undertone of myrrh to ground it. I dab it on at my pulse points. I also have a small vial of jasmine oil that I use for special evenings with Boyfriend. Every man I’ve ever met goes wild for the smell of jasmine. Once in a while, maybe a couple times a month, I’ll give myself a real scrub-down with a pair of exfoliating gloves. I rinse with cold water, and apply rose-scented apricot kernel oil to my body. It leaves me smooth and glowing and just a little pink. This is particularly nice in conjunction with my weekly mask. I can apply my mask, and rinse it off under the warm showerhead. The steam helps soften the clay a bit before rinsing, so I don’t have to scrub my face too hard. But for the most part, my body care ritual is simple and focuses first on best practices, and then on just a few good-quality ingredients. It’s just enough to keep me feeling feminine and clean without overdoing it. There will also be future parts dedicated to hair, makeup, and nails! Thanks.